Unlike version 8.0 that took 18 month to complete, Version 8.1 final is ready in under two months. If you have been following Zoom Player development on Facebook, Twitter or the Zoom Player Forum, you would have noticed that over 20 public preview builds were released. The new release schedule ensures faster bug fixes, polished features and new customization options in a shorter time span. The default Onyx skin has been refreshed with new widgets and power features. A much more powerful audio track and subtitle stream selection interface. More powerful skinning engine logistics. No other media player matches Zoom Player's versatility and integration with cutting edge technology. It's taken a long time, but it is finally here... Zoom Player version 8 is ready to go! The long development time was well spent, with 120+ hot new features & settings, 60+ changes & enhancements, 100+ bugs squashed and a 52k change log. I'm very happy to announce Zoom Player v8 Release Candidate 3. It took longer than I initially anticipated, but the time didn't go to waste. The entire Inmatrix team with a big thumbs up to the closed beta volunteer team stepped up and together we've stomped dozens of bugs, some dating back years. Stomping out bugs is time consuming. It requires multiple user reports to finely target the bug and testing on multiple systems to ensure the fix is stable, all of which taking plenty of time. While we waited for the bug tracking data to pour in, we used the time well. We declattered interfaces, improved workflow and made them fully keyboard accessible. We then added long requested usability features, such as the ability to search through Zoom Player's massive array of features and settings accessible through the options dialog. We enhanced the internal JPEG decoder to automatically rotate pictures based on orientation information embedded in JPEG files (most cameras support this function). And this small list barely covers the surface. With so many changes, enhancements and fixes in the code, there was an internal discussion on whether to release a final version, or a third release candidate. I made the decision to issue another release candidate. I feel a few weeks of testing is warranted to ensure a smooth final release. This will be the last beta prior to the final release. Please take this time to test the new and updated features and verify that bugs are properly squashed. Since this is not the final version, the navigation interface skins currently available for download on the website have yet to be updated. Once the final version is released, we'll update the existing navigation interfaces for version 8. If you have more questions on this subject, leave a post on the forum and our moderators will assist you. 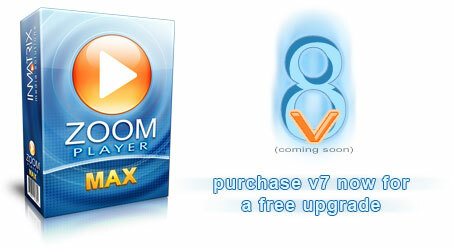 If you've previously purchased "Zoom Player Premium", you can download version 8 here. The premium version is being phased out, but as a gratitude to our loyal users, we're still providing existing users with a free upgrade path to version 8. 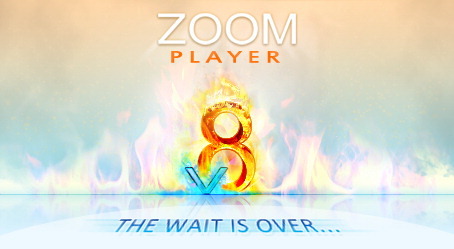 Click to visit the Zoom Player v8 Release Candidate 3 download page. visit the Zoom Player v8 Release Candidate 3 forum thread. Hi, We have released Arabic & Turkish language files for Zoom Player v8 RC2. Version 8 is nearing final, we're aiming to release a final version soon. We're also in the process of creating several new video tutorials on how to use Zoom Player with remote devices. We'll release two videos, a tutorial for MCE compatible remotes (or any RC6 protocol) and BlueTooth based remotes (we're planning to use the PS3 Blu-Ray remote in the tutorial). Stay tuned. We're finally ready to release Zoom Player v8 RC2. Since this is not the final version, the navigation interface skins currently available for download have not been updated and are missing a few files which you can copy over from the "Drapes" directory. If you've previously purchased the premium version, you can download it here. Click here to download Zoom Player v8 RC2. We're finally ready to release Zoom Player v8 RC1. For the first time since v5, we are releasing a FREE version of Zoom Player. The new version is called "Zoom Player Home FREE" and it's probably the most intuitive, powerful and customizable free media player for the Windows PC. We are no longer promoting or selling the Premium version (it's still unofficially supported). What's the difference between versions (FREE/Pro/MAX)? Check out the Feature comparison chart. 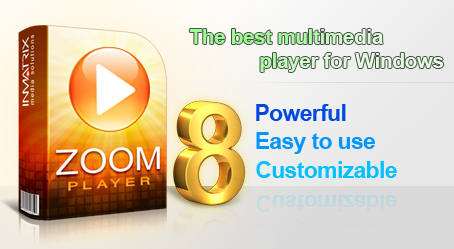 Click here to download Zoom Player v8 RC1. P.S. We have a few more items up for grab soon, a variant of the drapes nav, HD resolution background images and more. Stay tuned. It's been a long time since the last news update, but the wait has been worth it, Zoom Player v8 release candidate 1 is scheduled for public testing within the next week. And that's not the only good news. Version 8 marks the re-release of the free version of Zoom Player and it will be packed with more features than ever before, stay tuned! Update: We're going to take a few more days to make sure the release is as polished as possible, so we now expect to make the release Sunday or Monday.